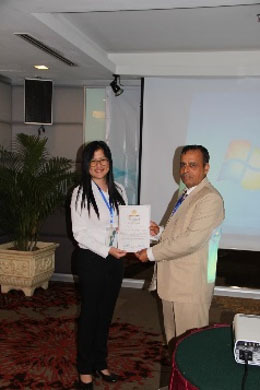 Koay Mei Yuan (left) receiving the certificate of ‘Best Presenter’ from the Chair of the conference session on Image Processing and Communication Engineering, Prof Dr Rajender Singh Chhillar (right), a Professor at the Department of Computer Science & Applications, Maharshi Dayanand University, Rohtak, India. 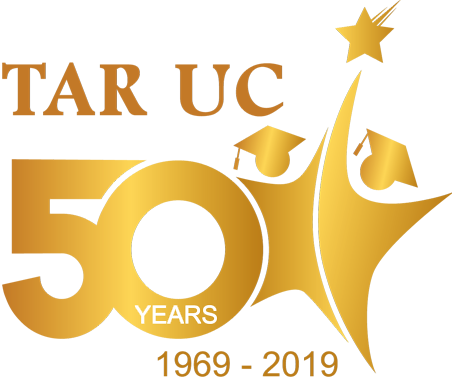 TAR UC continues to make waves in science and technology when one of its graduates received an award at the 2018 International Conference on Control, Robotics and Informatics (‘ICCRI 2018’) which was held from 7 – 9 April 2018 in Kuala Lumpur. Koay Mei Yuan, who graduated from TAR UC with the Bachelor of Engineering (Hons) Electrical and Electronics was named as one the best presenters in the said conference. The conference is a global gathering of experts in advanced characterisation techniques in the highly complex fields of control, robotics and informatics, to present and deliberate the latest methods, research developments and future opportunities. Mei Yuan presented her paper entitled "Feature Selection for Automated Grading of Edible Birds Nest with ANFIS". The paper is based on the two final year projects done by Mei Yuan and another TAR UC graduate, Selina Loh Xin Ci who graduated with the Bachelor of Engineering (Hons) Mechatronic where both of their final year projects are based on the same topic which is Automated Grading of Edible Bird Nest. Assoc Prof Dr Lai Weng King, Acting Dean of the Faculty of Engineering (‘FOEN’) in TAR UC was the supervisor for both projects and with the additional help from Dr Goh Kam Meng who is from the Department of Electrical and Electronics of the FOEN, the combined results of these projects were then submitted to be peer-reviewed for this conference. As a presenter, Mei Yuan competed against other experts and postgraduate students to come out as one the best presenters in the conference. “It was a nerve-wracking experience for me for two main reasons. Firstly, we had to summarise the 6-page paper to fit into a 15-minute presentation and this was the most crucial part as the team wanted to ensure that my presentation should include all the important aspects of both the projects. Secondly, the audience that I had to present to are experts from across the globe and having no prior experience presenting in front of such a knowledgeable crowd was no help at all. However, I greatly appreciate the support given by my team especially Assoc Prof Dr Lai for his guidance and encouragement which really helped me to present well. On top of this, having to do numerous presentations as part of my coursework assignments during my study in TAR UC was a great help to me in this conference,” she explained.